Samsung Galaxy A8 (2018) and Galaxy A8+ (2018) now official! Home / mobile / news / samsung / Samsung Galaxy A8 (2018) and Galaxy A8+ (2018) now official! After starring on numerous leaks and rumors this week, Samsung Galaxy A8 (2018) and Galaxy A8+ (2018) premium mid-range phones were officially announced. Both smartphones boasts the beautiful aesthetics found on the Galaxy S8 series and improved some minor details in it. In addition, both has IP68 water and dust resistance and Infinity screens. Moreover, both has dual selfie camera setups designed to match or even beat the competition. 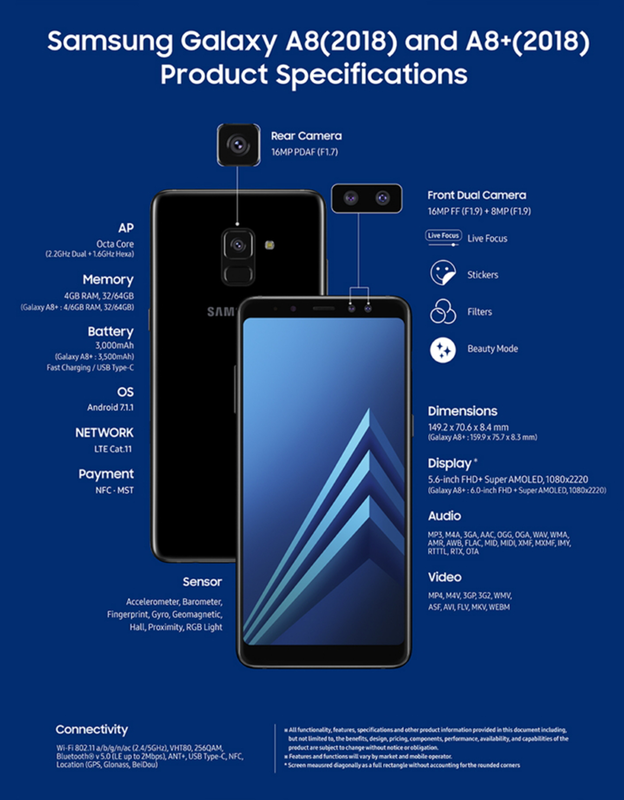 Going to the actual specs, the Galaxy A8 (2018) the smaller phone. It features an 18.5:9 aspect ratio 5.6-inch Super AMOLED screen with FHD+ 2220 x 1080 resolution. On the other hand, the Galaxy A8+ (2018) has the bigger 6-inch FHD+ Super AMOLED screen. Under the hood, both are powered by a 2.2GHz 64-bit octa-core processor. The Galaxy A8 (2018) has 4GB RAM while the Galaxy A8+ boasts up to 6GB RAM. Both will come with either 32GB or 64GB expandable storage via microSD card up to 256GB. The Galaxy A8 (2018) has 3,000mAh battery while the Galaxy A8+ (2018) comes with the bigger 3,500mAh juice. Both has USB Type-C ports. On the camera part, both has the same setup. Behind, you'll see a 16MP f/1.7 lens with video digital image stabilization (VDis) technology, hyperlapse, and food mode. In front, its clear that Samsung made this a selfie-centric phone. It boasts a 16MP f/1.9 lens paired with another 8MP f/1.9 sensor. This dual selfie cam setup has the ability to produce deep background blur and create bokeh effect. It also has the Live Focus feature allows users to adjust the bokeh effect even after capturing the self-portraits. On the connectivity part, the smartphones have WiFi, 4G LTE, Bluetooth 5.0, A-GPS, and NFC. It is unclear yet whether this handset will feature dual SIM card slots. Both phones will also sport Samsung Pay and the first Galaxy A series to support Gear VR headset. They'll come in four color options including: black, blue, gold, and orchid grey. Both phones will be available early next year. The price was not yet announced though.